September 2015 - Gloria Muriel paints two murals at Espacio Entijuanarte headquarters in Tijuana, Mexico. Two Coyotes was inspired by immigration debate at the US-Mexico border. Spirit Animal was a concept developed and completed with artist in collaboration, Alex H. Banach. September 2015 - Gloria Muriel presents fine artwork and live paints at the first annual KAABOO Festival, in Del Mar, CA. 8 August 2015 - Gloria Muriel teaches mural art at the 5th annual Art for Autism Summer Camp for girls at the Center for a Healthy Lifestyle in Solana Beach, CA. The summer camp is hosted by the Autism Tree Project Foundation. On July 1st, 2014 The San Diego Union Tribune published a cover story about Art for Autism Summer Camp. On August 6th, 2013 The Del Mar Times published a cover story entitled "Children thrive at Autism Tree Project Foundation's art camp in Solana Beach." 1 August 2015 - Gloria Muriel live paints at Secret Table Charity Event in La Jolla, CA to benefit Autism Tree Project Foundation. May 2015 - Gloria Muriel live paints at the 13th annual spring Joshua Tree Music Festival. June 2015 - Gloria Muriel participated in a project hosted by the San Diego Canyonlands nonprofit organization. Auburn Creek cleanup project is intended to restore the canyon space, which had been used as a dumpsite for household waste. They removed overgrown nonnative plant species, and replanted a variety of native plants. Gloria Muriel collaborated with Alex Banach to paint a mural and create a mosaic tile over a bare concrete space adjacent to the canyon area. A series of art workshops were taught by Gloria at the local community center, and ideas generated by children of the community were used as elements in the creation of the mural. The mural depicts a sun, a moon, and an ocean in between. 13 April 2015 - Gloria Muriel exhibits original art at The Loft at U.C. San Diego. 16 April 2015 - Gloria Muriel participates in a large group show at Makers Quarter. Expect art installations, libations from Old Harbor Distilling, beer from Karl Strauss, delicious sliders from The Ballroom, and good music. EXIST1981, Spenser Little, Carly Ealey, Christopher Konecki, Dolan Stearns, Neko, Joey Vaiasuso, Kevin Peterson, Sergio Hernandez, Brooks Sterling, Jaclyn Rose, Denial, Matt Stallings, Nicole Waszak, Onions, Tocayo, Bart Club, Celeste Byers, Aaron Glasson, Eno, Joshua Krause, Diekuts, GANE, Brisk, Buffalo Viez, That Kid Peep, SenzWen, Letter Cat Sign Co., Wendy Teague, Brian Hebets, Paul Drohan, Randall Christopher, C. Bilyeu, Maxx Moses, Nick Mcpherson, Gloria Muriel, Julian Martin, Dion Terry, Eye Gato, España Garcia, Yarns and Noble, Keemo, Sonia López Chávez, Cory Ring, Jeff Raddatz"
29 March 2015 - Gloria Muriel collaborates painting a mural at Makers Quarter in the East Village neighborhood with Amanda Lynn, Erin Yoshi, and Carly Ealey to promote the first annual KAABOO Del Mar. 11 April 2015 - Gloria Muriel live paints at Harley Davidson Rebel Pit with proceeds from auction to benefit Autism Tree Project Foundation. 11 April 2015 - Gloria Muriel participates in Monster Drawing Rally at San Diego Art Institute. 4 April 2015 - Gloria Muriel live paints for auction to benefit Autism Tree Project Foundation at Secret Table dining event. March 2015 - Gloria Muriel exhibits works at the first annual Latin American Art Festival at Casa Valencia Galería. 12 March 2015 - Gloria Muriel collaborates on a mural entitled Tunnel Vision with Alexander Banach for Makers Quarter in the East Village neighborhood of San Diego, CA. The mural symbolizes the antahkarana as a healing symbol, and represents the moment of singular realization of totality of two mind states. The antahkarana is believed to be the essence of "I" that reincarnates, linking feelings, intuition, and the opening of wisdom with that of the declarative memory of everyday life. The intention of Tunnel Visions is to present conceptual framework for philosophical abstraction of ideas absent in the consensus of western society, borrowing lines and patterns inherent to the beauty of the natural world. There's something about artist Gloria Muriel (aka Glow) that makes complete strangers into instant friends. Call it good people skills, or just being a nice person, Glow, much like the definition of the word itself, emits a steady radiation of positive energy to all she meets. A beautiful translation of her uplifting vibes is seen in her colorful, mood evoking paintings and large scale murals. Interweaving bright colors blended into magical organic shapes, Gloria's layers push and pull through perspectives while usually maintaining a central focus of a girl's face with soul piercing, wide-set eyes. Meditate on one of her pieces long enough, and you could find yourself transported to the ocean . . . or another dimension. Mexico native, Gloria is a graphic designer by trade. "I always wanted to be a cartoonist," she explains while recounting her childhood dreams. "I wanted to work for Disney or be an illustrator, but people were always asking me to design their logos and things like that so I started doing more design." Beyond her own inner child, being a mother of two daughters correlates to the inspiration of the young girls in her art work and fantastical imagination. Often stemming from a pop-surrealist state of mind, Gloria's animal and tree-like characters she creates seems to come from a spiritual place open to interpretation to each individual that views them. "Take deep breaths," she instructs while gazing at her mural in progress on the side of the building at Silo. "What do you see?" In Gloria's latest mural titled, "Tunnel Vision," she works with frequent collaborating artist Alexander Holst Banach a.k.a. Phase Racer. While Gloria's aesthetic tends to be soft and free flowing, Alex lends a more masculine structure to their compositions allowing for an opposing effect. Alex's favoritism for clean lines can be attributed to his background as a Neuroscientist with a knack for dissection. When asked about their approach to their mural process, they also differ. Alex likes to have a concept and plan ahead of time, but is prepared for the last minute reversal depending on Gloria's intuitive whim. "Every wall has a different energy influenced by the city and community. You never know what it will be like until you feel it," Gloria explains. "You can have it all planned out, then get to the wall and decide you don't want to do this at all and do something totally different." Over the years Gloria has accomplished endless murals and collaborative street art installations throughout the US and Mexico as well as establishing herself as a collected fine artist. One of her more recent elaborate installations can be enjoyed locally at Común Kitchen and Tavern in Downtown San Diego. February 2015 - Gloria visits EuroArt frames in Chula Vista, CA before delivering a commissioned minotaur drawing based on the zodiac symbol taurus. January 2015 - Gloria Muriel collaborates with Alexander Banach to paint a mural for BuiltCulture. The mural is located on the east facing wall of 3426 Adams Ave, San Diego, CA 92116. January 2015 - Gloria Muriel collaborates with Alexander Banach to paint a second mural for an exterior wall of Bread and Salt Gallery in Barrio Logan neighborhood of San Diego, CA. The title of the mural is Urban Spirit Tree. 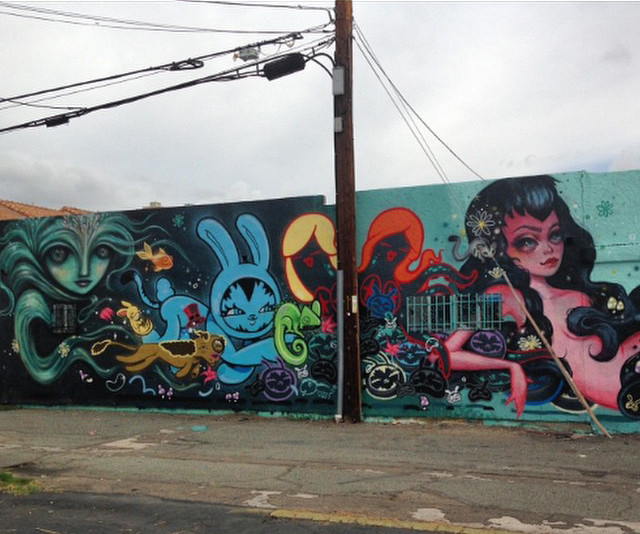 November 2014 - Gloria Muriel collaborates with Dave Persue and Tati Suarez on a mural for Animal House Pet Store in the North Park neighborhood of San Diego, CA. July 2014 - Gloria Muriel paints a mural at an elementary school in San Telmo, Buenos Aires. December 2014 - Gloria Muriel paints a mural for Goldline Salon in the Golden Hill neighborhood of San Diego, CA.